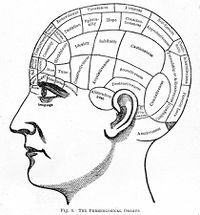 Phrenology, (also known as craniometry, craniognomy, or physiognomy) enjoyed such widespread popularity in Victorian Britain that its theories influenced everything from popular science to Great Britain’s reckless imperialism, the new science of anthropology, and its followers’ very perception of themselves and other individuals. 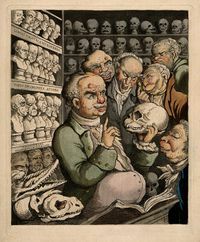 Because the practices of phrenology, and its close cousin physiognomy, were framed as accessible to the general public, these “sciences” were popular among all social classes. These types of popular sciences were fraught with doctrines that seemed to disregard religion, and therefore, many gentlemen scientists were compelled to reconcile their religious beliefs with their scientific beliefs. Agnosticism, atheism, and irreligion were associated with the lower classes during the nineteenth century, so any respectable individual sought to steer clear of these associations. This article seeks to explore connections between phrenology and irreligion and/or atheism in the nineteenth century. Just as, in modern medicine, we have classified various regions/lobes of the brain as responsible for controlling specific human functions (i.e., the frontal lobe controls speech, smell, and movement), phrenological science divided the brain into segments that were visible to the naked eye via protrusions and/or indentations of localized areas of the head. An individual trained in phrenological principles could, as it were, obtain a psychological profile of a person simply by running their fingers across her scalp. How often do we, in the modern age, judge a person’s character based on their outward appearance? Almost all the time, correct? The Victorians were no different, and what’s more, phrenology gave this practice scientific justification – of course an individual’s appearance would reflect their temperament! It just made sense! We should be careful to remember, though, that the 1800s were a time period fraught with racism, classism, and n absence of the scientific method, as we now know it. Since the skull ossifies over the brain during infant development, external craniological means could be used to diagnose the internal states of the mental characters. Gall identified 27 organs or propensities, each correlated with a different personal characteristic. Later, in Britain, George Combe summarized his understanding of phrenology as such: "The same Divine Wisdom which ordained the universe, presided also at the endowment of the brain with its functions; that the brain is the organ of the mind, and the mind is the noblest work of God." Both Combe and Gall were members of the middle and upper classes, and therefore, it was imperative that they explicate their findings in a way that did not conflict with Biblical teachings. Were Phrenology and other new Victorian Sciences Irreligious? New sciences such as phrenology had to walk a very careful line to avoid being associated with irreligion and atheism. Nineteenth-century England was a time fraught with struggles between the Church of England (C of E) and the plethora of new scientific discoveries and theories, in general. Charles Darwin published his seminal work, On the Origin of Species, in 1859. There were others before and after him that echoed similar biological sentiments – Jean-Baptiste Lamarck published his theory of evolution by the inheritability of acquired characteristics in 1800. Furthermore, Charles Lyell’s Principles of Geology, published in 1830, argued that the formation of the earth’s crust took place by minuscule, incremental changes over extremely long periods of time – Lyell’s book was actually a crucial influence to Darwin’s theory of natural selection, and the two gentlemen corresponded in great length. Darwin, in proposing that humans were not the most special creatures, created by God in his image, was essentially calling into question centuries-old theological doctrines. He and other “gentlemen scientists” were forced to reconcile their religious beliefs with their scientific discoveries, and this was not often an easy task. Many scientific discoveries during this time were met with opposition from the more “respectable” ranks of society simply because they challenged religious principles. Yet, phrenology enjoyed widespread popularity among Britain’s middle classes despite its somewhat glaring allusions to materialism. Some of its upper-class followers felt compelled to reconcile phrenology’s doctrines with religion. The British physician Charles Cowan published his treatise, Phrenology Consistent with Science and Revelation, in 1841 – in it he argued that since the same God rules nature and revelation, science and religion must ultimately be in harmony. If one examined phrenological beliefs in depth, one would find that different regions of the brain were responsible for various mental attitudes, and thus, the phrenologist was essentially claiming that these relationships made up the human soul/spirit. As David de Giustino states in his book Conquest of Mind: Phrenology and Victorian Social Thought: “If the mind could not exist without the brain, then the mind was dependent on matter, therefore phrenology led to materialism”. The fight for phrenology’s virtue (or lack thereof) was very publicly waged in both newspapers and book-length treatises. And as we shall see, the abundance of primary-source publications on the subject pay testament to the ambiguous social position of not only phrenology, but also of Victorian anthropological and scientific discoveries in general. Phrenology’s founders and popularizers went to great lengths to dissociate their science from irreligion, and such efforts helped to make the science acceptable to the mainstream (and generally religious) public. Yet, there were many among the British artisan and working classes that subscribed to phrenology because of its radical and anti-religious implications. To these people, phrenology was the ultimate proof that the mind was not divinely ordained. The science was manipulated by those with political agendas and used as a prop to support not only a divorce of Church and state, but also a complete rejection of Christian religious dogma. The historiography of nineteenth-century science does not typically associate phrenology with irreligion, mostly because, as we’ve seen, orthodox practitioners and adherents of the science sought to distance themselves from those who ‘misapplied’ it to support radical ideologies. This does not mean that irreligious implications were not apparent. Like many sciences in Victorian Britain, phrenology could easily be manipulated to promote radical political and social objectives. Before we begin to examine the relationship between phrenology and anti-religious sentiment, it’s important to note that the working (lower) classes of Britain were far more likely to subscribe to agnosticism, atheism, and other radical ideologies in the nineteenth century. This was because church and state were intimately linked in the U.K. (and still are), and the working classes believed the entire system was working against them, seeking to keep them uneducated and impoverished. However, due to various political movements and innovations in printing technology in the mid-nineteenth century, the working classes could now afford to educate themselves. They learned to read and write – something that was almost unheard of among the lower orders before this time. As momentum grew, the lower classes began to obtain their information on current events through pamphlets, journals, serials, etc., – and often these publications contained a heavy dose of political radicalism and a general disdain for the power of the C of E. To put it plainly, these people sought what we know refer to as a secular state. Richard Carlile, one of the most notorious political agitators of the nineteenth century and founder/editor of a number of working class publications, saw phrenology as perhaps the first credible representation of blatantly atheistic science. In an article in his radical periodical The Republican, Carlile stated that ‘[phrenology] strikes at the very source of religion, and is a new and invincible proof of the good foundation of the science called Atheism or Materialism’. Carlile was vehement in his attempts to use phrenology to buttress atheism, stating that ‘the science itself is centered in materialism, and annihilates by demonstrative proofs all ideas of spirit or human soul.’ This concept – the lack of a phrenological location for the soul – was the foundation upon which almost all phrenological arguments against religion would be built. If every part of the brain was mapped out, where was the human soul located? Not only did Carlile see phrenology as an argument to disprove religion and the existence of the soul, but he also believed ‘the science will greatly aid the moral powers of mankind’. He saw phrenology as equalizing – ‘rightly putting the whole race of animals upon one and the same foundation as to qualities’. Phrenology was not the only science Carlile endorsed, though; he would later write myriad articles and pamphlets that endorsed evolutionary theory as the ultimate denouncement of the Christian religion. And he would not be alone. As Sherrie Lyons states in her study of nineteenth-century ‘pseudoscience,’ "The controversies surrounding phrenology represent a microcosm of the philosophical, religious, political, and scientific debates of the time." 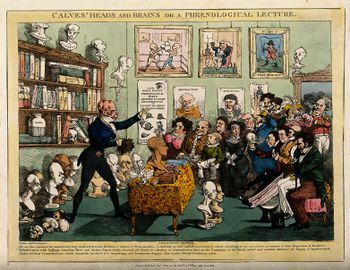 It is easy to get caught up in the many controversies surrounding phrenology, but we must keep in mind that whether one accepted its doctrines or not, it pervaded nineteenth-century social milieus. Despite the fact that phrenological science was later found to be incorrect, the hype and controversy surrounding the “science” can teach us a great deal about the fate of new scientific discoveries during a time when science, as a discipline, was still in its infancy. Phrenology reminds us that sciences of the past should not be analyzed based upon their accuracy or inaccuracy, but rather on their ability to impact society. Phrenology did not fail – it was superseded by currently mainstream science that itself will likely be superseded by science yet unknown, and so on and so forth. ↑ The British Empire reached its height in 1922, when Britain held sway of a quarter of the world’s population. A common phrase during this time was: “The sun never sets on the British Empire”. See: Winter, Alison. Mesmerized: powers of mind in Victorian Britain. Chicago: University of Chicago Press, 2000. ↑ As summarized in: Sherrie Lynne Lyons, Species, Serpents, Spirits, and Skulls: Science at the Margins in the Victorian Age (SUNY Press, 2010), 53. ↑ George Combe, A System of Phrenology (J. Anderson, 1830), ix. ↑ See: Darwin, Charles. On the Origin of Species. Cambridge: Penguin Classics, 2009. 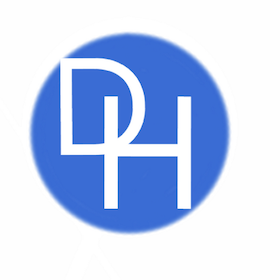 ↑ A gentleman scientist was a person who pursued scientific ventures with his own money – these men (and they were exclusively men) were often members of the landed and upper classes, and thus had certain reputations to uphold. ↑ Cowan, Charles. Phrenology Consistent with Science and Revelation. London: Sherwood & Co, 1841. ↑ De Giustino, David. Conquest of Mind Phrenology and Victorian Social Thought. Routledge, 2016. ↑ Richard Carlile, The Republican 13, no. 15, 14 April 1826, 449, 451.